BBXC $100,000,000 BBXC Airdrop and Buyback Guarantee Alert! HomeCompany NewsBBXC $100,000,000 BBXC Airdrop and Buyback Guarantee Alert! 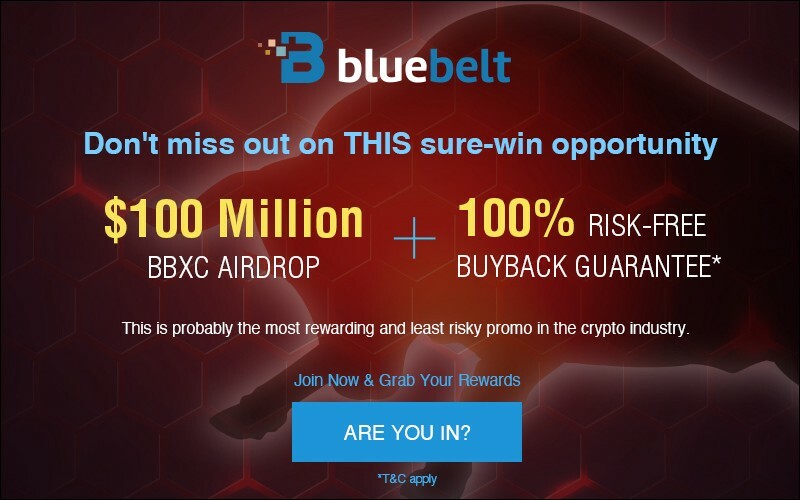 To celebrate the listing of the BBXC token on Bluebelt Exchange, we are launching our $100,000,000 BBXC Token Airdrop with a Buyback Guarantee promo. Yes! You’ve read it right. It comes with a Guaranteed Buyback! Buy at least $25 worth of BBXC tokens and get 70% more free BBXC tokens via Airdrop! 1. Get guaranteed buyers at fixed prices when you sell. No horrible market pricing. 2. Sell it in less than two years and we’ll buy back your tokens at $0.50 per token, fixed price, GUARANTEED. 3. Sell it after 2 years and we’ll buy back your tokens at $0.90 per token, fixed price, GUARANTEED. 4. Refer buyers to get 30% of their Airdrop Bonus. Every user who purchased BBXC with a minimum of $25 during the promotion period will automatically receive an additional 70% purchased amount bonus in BBXC. Would you like to receive more updates from our BBXC Airdrop Campaign? Like our Facebook Page, follow our Twitter profile, and join our Telegram group! How to Join the $100,000,000 BBXC Airdrop & Buyback Guaranteed Promo? 1. Go https://www.bluebelt.asia/ and register for an account. 2. Go to our BBXC Airdrop Campaign form and fill out the necessary details. 3. Wait for a confirmation link from us. If you are interested with our BBXC $100,000,000 BBXC Airdrop & Buyback Guaranteed Campaign, buy your BBXC tokens now and refer more buyers and get 30% of their Airdrop bonus!